(Tour ends October 30th). 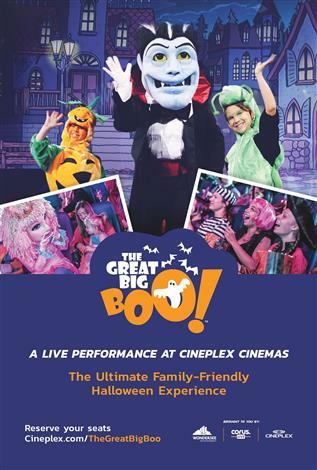 This October, Corus Live presents The Great Big Boo! – the ultimate family-friendly Halloween experience. And we’re coming to a Cineplex theatre near you! Musical theatre meets trick-or-treating in this spectacular, non-scary show for kids! Join Zoe and Justin as they sing and dance their way through Boo Alley! Along the way, they’ll meet wacky, larger-than-life characters and embark on a quest to save Halloween. Through a maze of wild adventures, our new friends will overcome their fears, realize their dreams and discover the true spirit of Halloween – you can be anything you want to be! Featuring a dynamic original score, spectacular dance numbers and stunning theatrical effects, the show is sure to captivate and delight the whole family. Following the show, the audience is invited to meet the stars of the show, and join them for a fun, trick-or-treat event!